It is those middle school students interested in history, writing or even fashion that Southern Illinois University Edwardsville’s Matt Johnson said they are trying to woo toward science, technology, engineering and math (STEM) fields. With the help of a National Science Foundation grant awarded to SIUE’s STEM Center and Interdisciplinary Research and Informatics Scholarship (IRIS) Center, Johnson believes headway is being made. Students in the Coding for Community program will display their digital projects from 4:30-6:30 p.m. Thursday, April 6 at the East St. Louis Learning Resource Center on the East St. Louis Higher Education Campus, 601 James R. Thompson Blvd. “The program is advantageous for middle school students, because it lets them explore their community and document what they have discovered through the technological skills we teach them,” said Johnson, curriculum specialist at the STEM Center and program instructor for Coding for Community. “By studying program impacts, we aim to determine if digital humanities is an effective way to motivate and generate interest among middle school students in computing and other technology fields,” he added. The $847,000 grant, targeted to East St. Louis students, was awarded in 2015. The student program will conclude in December. 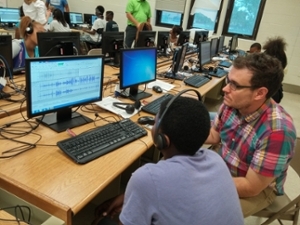 SIUE faculty and staff in STEM, English Language and Literature, and Historical Studies have worked with students from the middle schools of Mason Clark and Lincoln. The Southern Illinois University Edwardsville Center for STEM Research, Education and Outreach comprises an independent group of researchers and educators, innovating ways to engage students and the public in science, technology, engineering and math (STEM). Within the SIUE Graduate School, the Center brings together research faculty, graduate students and practitioners to conduct education research. The Center contributes educational expertise to SIUE undergraduate classes and provides professional development for K-12 teachers. The Center boasts a significant library of equipment and resources, which are available for loan at no cost to campus and regional instructors. For more information, visit siue.edu/stem or contact STEM Center Director Sharon Locke at (618) 650-3065 or stemcenter@siue.edu. The Interdisciplinary Research and Informatics Scholarship (IRIS) Center at SIUE is an interdisciplinary facility designed to support individual and collaborative scholarship (at faculty and student levels) that applies digital content as a primary methodology. Jeffrey Manuel, PhD, associate professor in the Department of Historical Studies, works with a student in the Coding for Community program.